OPEN CALL! Become a Northern American Regional Representative. 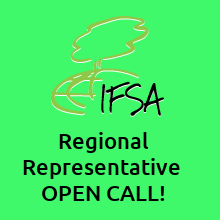 We are on the search for ONE Northern American Regional Representative (RR). This is an individual who is based within the North American region and able to act as the vital communication and information link between IFSA 7 and the Local Committees (LC) in his/her region. Please find the full list of duties, responsibilities and tasks beneath.